P.S. This is a scheduled post as I’m currently away on holiday! Thank you for visiting and leaving behind sweet comments! My apologies as I won’t be able to visit your blogs during this period. Do follow me at Instagram (@foodiebaker) to see what I am up to in Iceland! 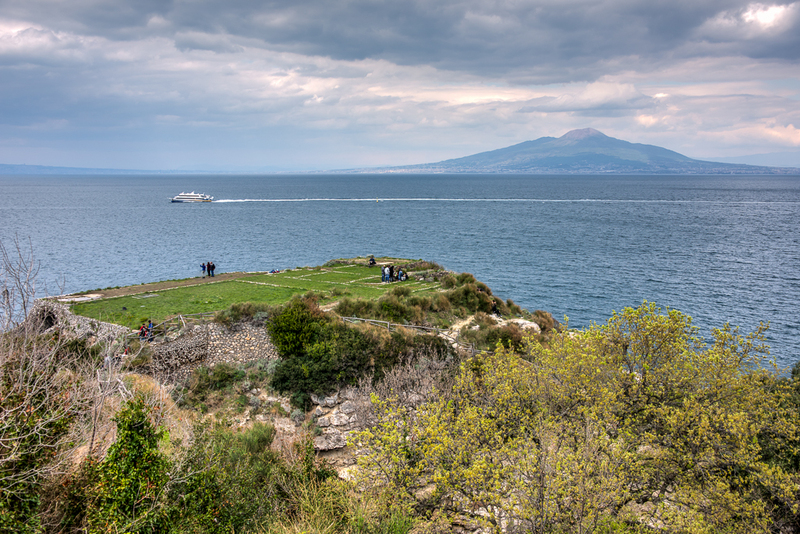 After our breakfast at our BnB, we walked to the Sorrento center to grab some food for a picnic later on. As it was still early, there weren’t many people around yet. 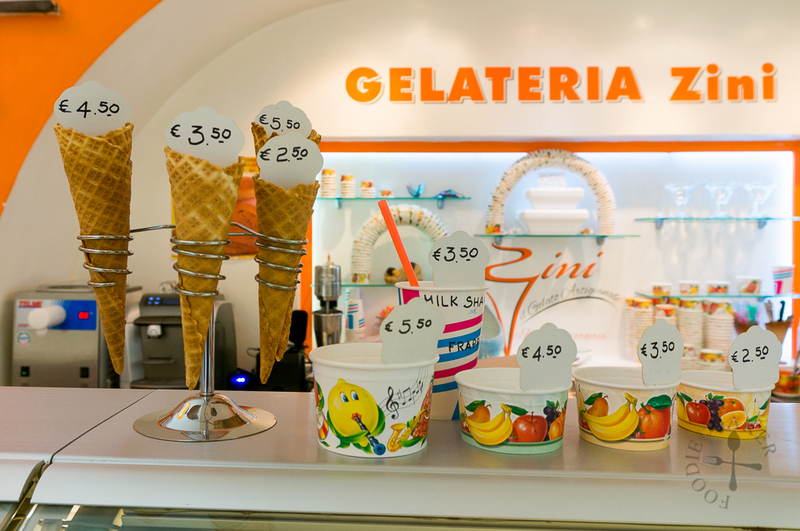 Gelateria Zini – time for some ice cream! And yes, it’s never too early for ice cream! 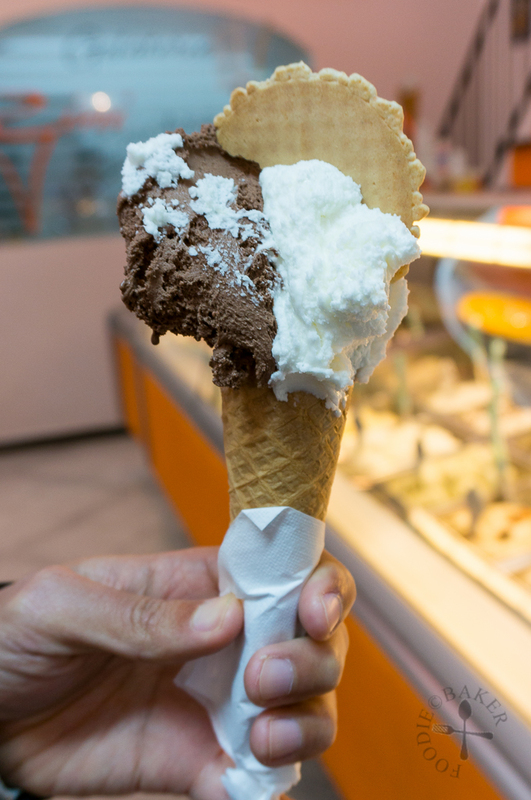 It’d be a real pity if I didn’t eat my fill of ice cream / gelato / sorbet in Italy, so despite the chilly weather, I started my ice cream eating feast. 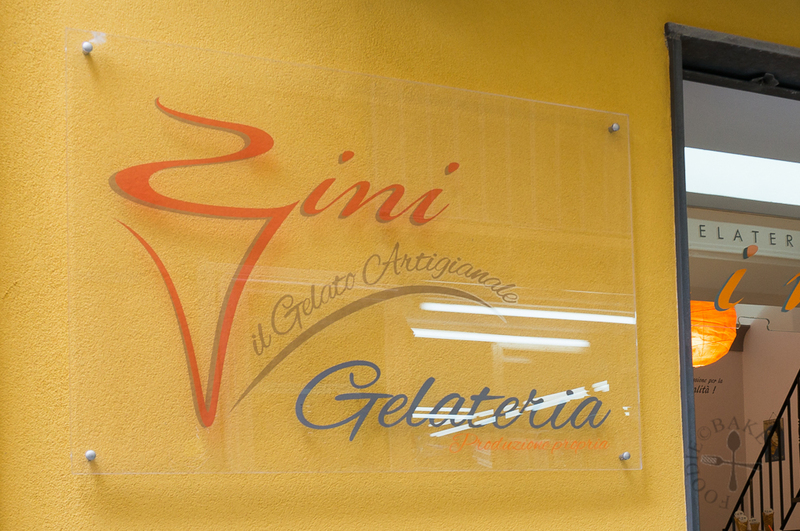 Gelateria Zini, opened in 1860, is reputedly the best gelateria in Sorrento. 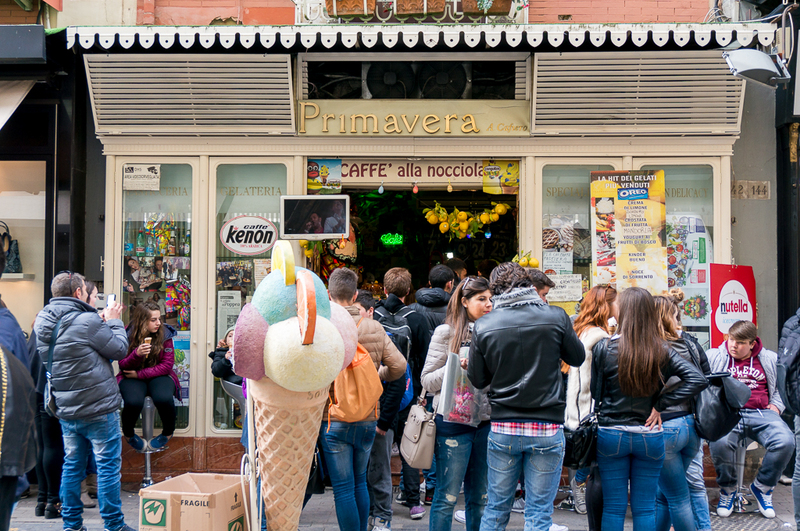 The gelateria is small, hidden and a little out of the way, but after some twist and turns in the small alleys, we found it! Here are the prices, clear and simple! As X only wanted to share, I could only choose 2 out of the 22 flavours they offered and it’s such a torture! 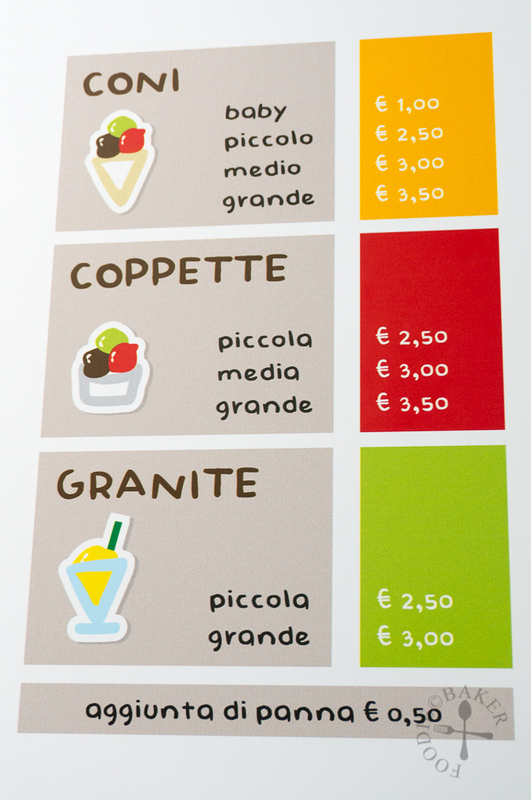 After much deliberation, I chose the €3.50 cone with dark chocolate and lemon sorbet. 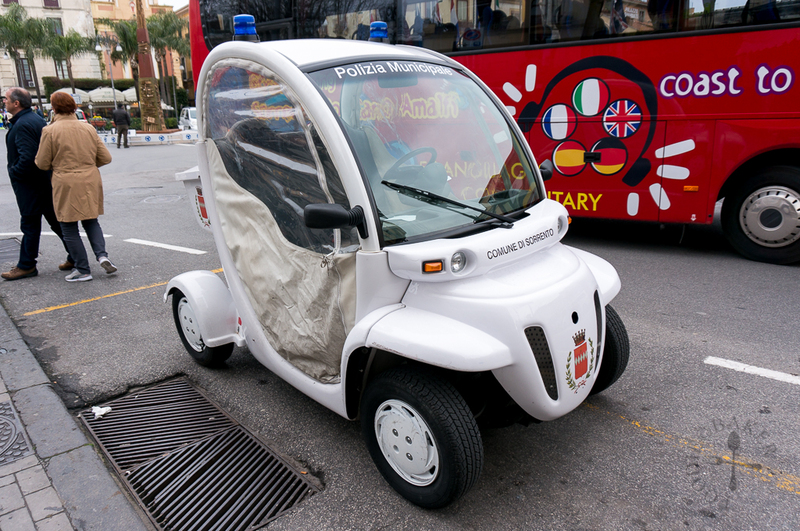 Looking back, if I was in Singapore and need to fork out €3.50 for an ice cream, I’d most probably just turn and walk away – it’s actually pretty expensive! But somehow this logic will not apply when I’m overseas… does this happen to you too? Anyway, the ice cream was delicious – the chocolate is rich and tasty while the lemon is light and refreshing, yum! 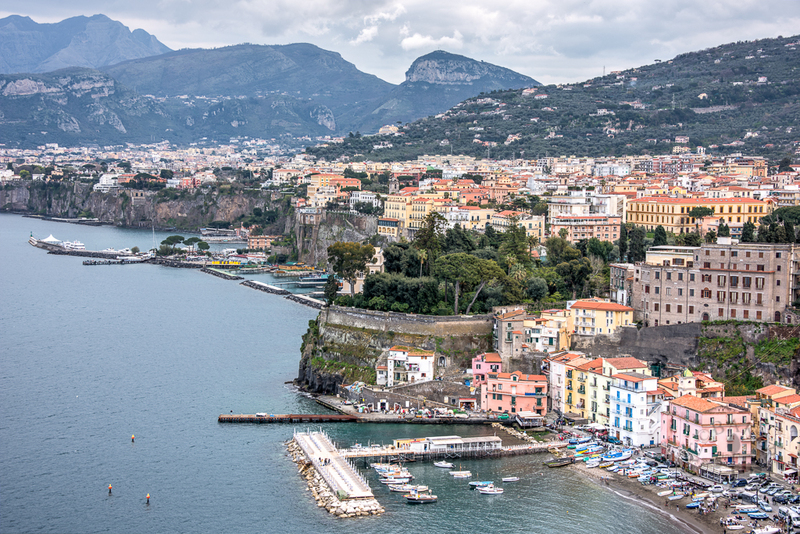 With my ice cream in hand, we continued to walk around Sorrento for a while more. 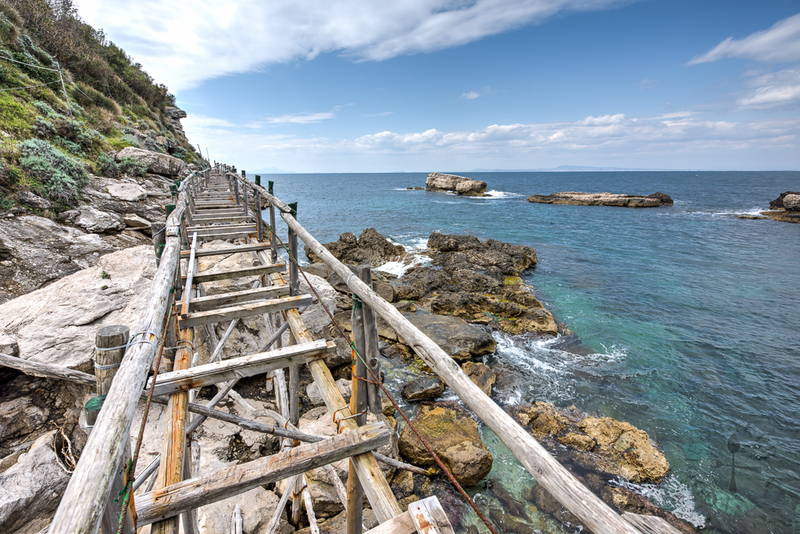 The walk can be a bit tiring as there are quite a number of stairs and slopes, especially if you are trying to get to Marina Grande, so take your time! 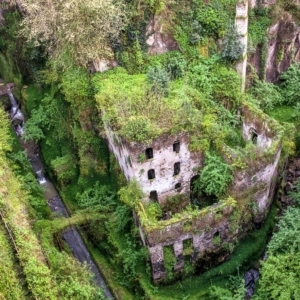 We then left Sorrento for Villa di Pollio Felice – Bagni della Regina Giovanna (House of Pollio Felice – The Baths of Queen Joanna), an ancient Roman ruins. 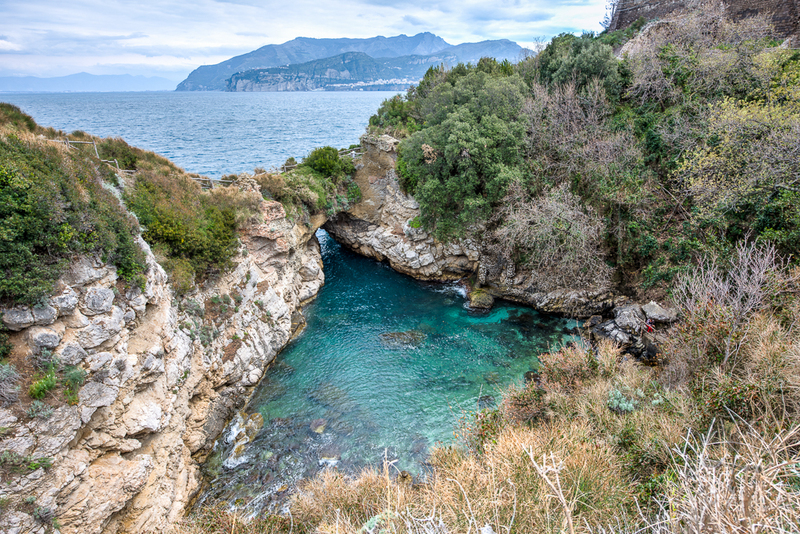 I highly recommend one to at least walk back as the view along Via Capo is not to be missed (and the downslope makes it less tiring). 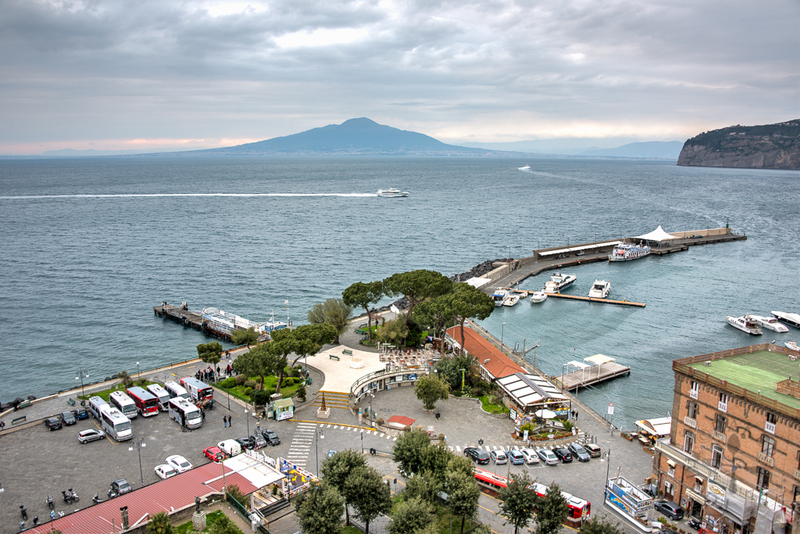 I’ve pinned a point on the map above (see the camera icon) where you can view the entire Marina Grande. 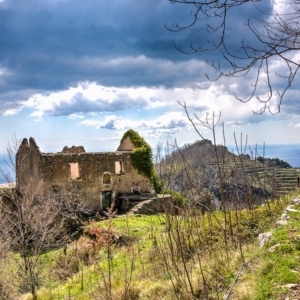 The ruins were once a villa overlooking Sorrento and the sea. We can still explore the numerous rooms of the villa but not much was preserved within the rooms, perhaps due to lack of funds? This triangular pool was where Queen Joanna took her bath, hence the name of the place. 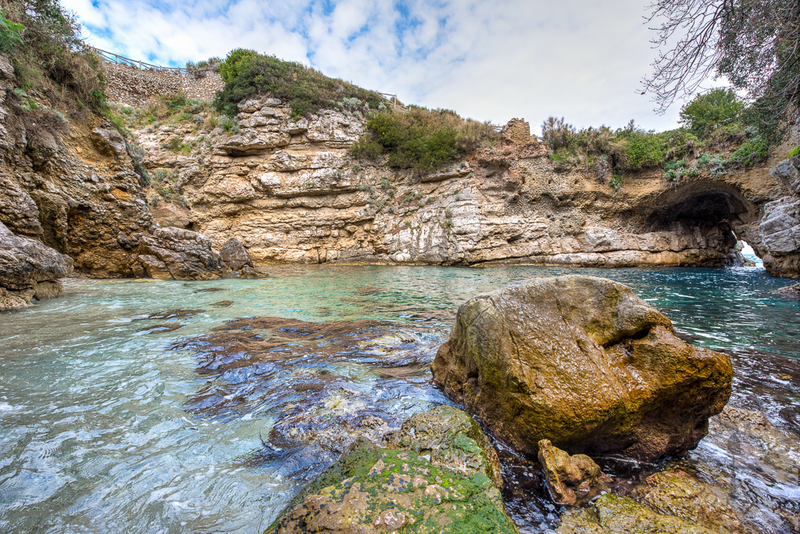 The surrounding rocks blocked most of the waves from the sea, creating a calm pool for swimming. Apparently this is a very popular place for swimmers, snorkellers and sunbathers in the summer. I’m a little glad that we came during spring, when it’s too cold to swim, because this place is quiet, serene and beautiful. Beautiful and serene place to have a picnic, or a dip, if you can bear the cold! We walked down to the pool, sat down and had some food. I love just sitting there, listening to the soft, lapping waves and nomming away my food. 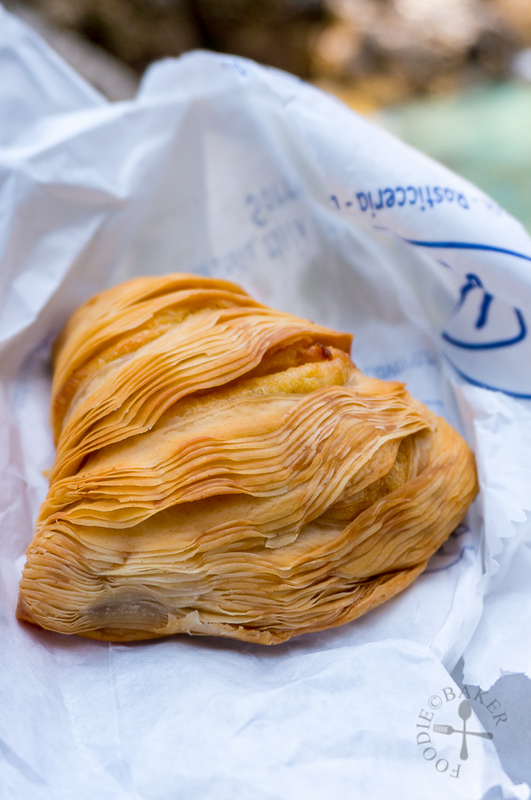 We bought a sfogliatella and a sandwich from Bar Rita – the sfogliatella was so flaky and crispy! 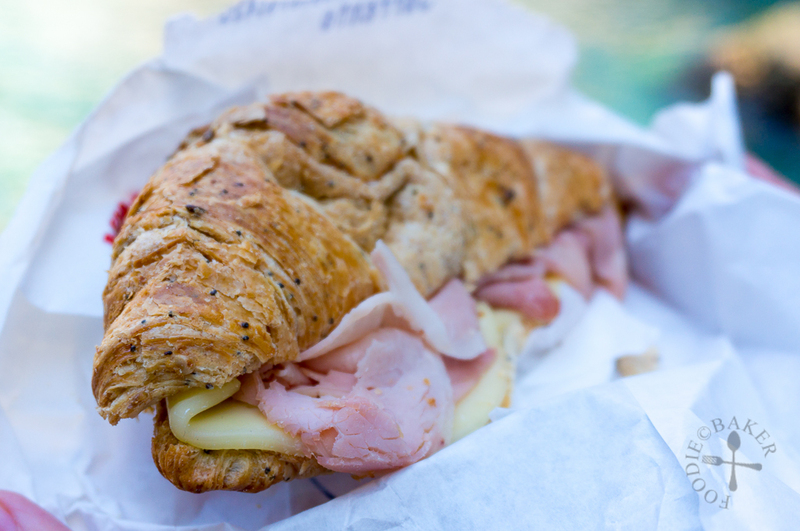 Soft bread, ham and cheese – can never go wrong! 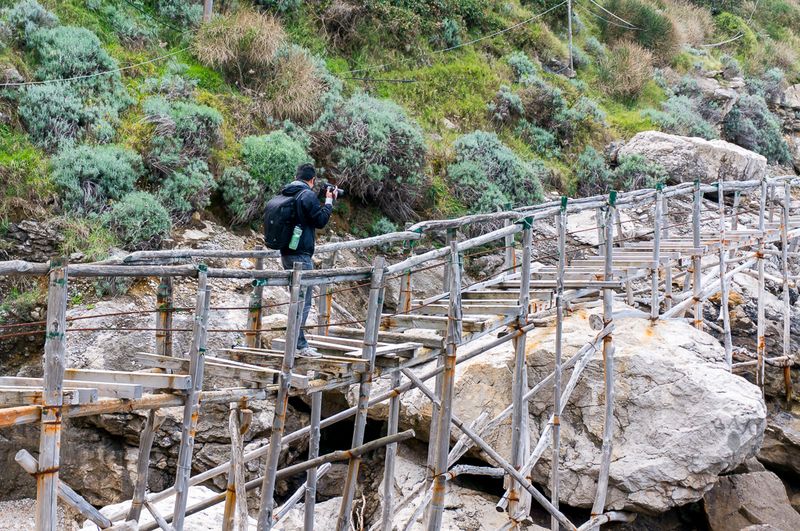 Further down the ruins is a wooden bridge which lead to a restaurant. Despite the “no-crossing” sign, X went ahead and took a shot. (I was being a coward and chose to sit and wait for him.) There is a restaurant on the other end but it’s closed – I’m guessing it opens only during the summer. Hopefully they have fixed the bridge by now! Here is the shot from the bridge! 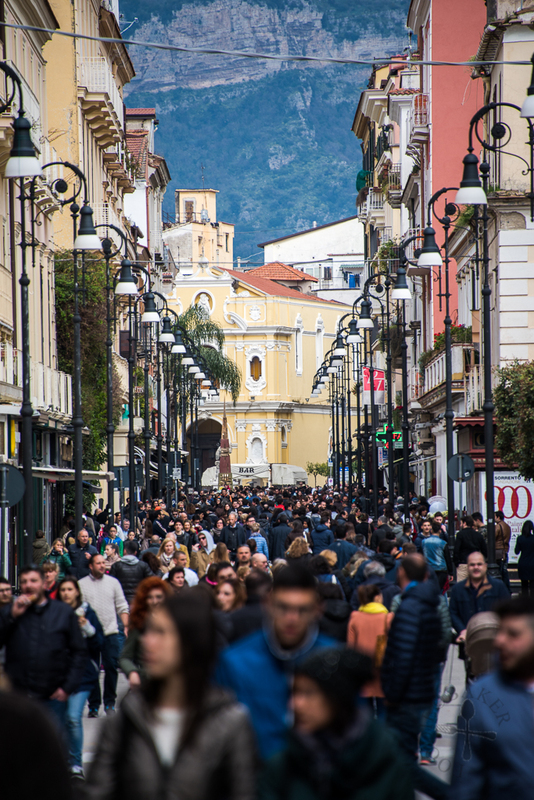 We walked back to Sorrento and was shocked by the number of people on the streets. Just look at how crowded it is! And I decided it’s time for my second ice cream (haha). This gelateria was crowded with people, and with the mindset that more people = more delicious food, I went in to get my next ice cream. 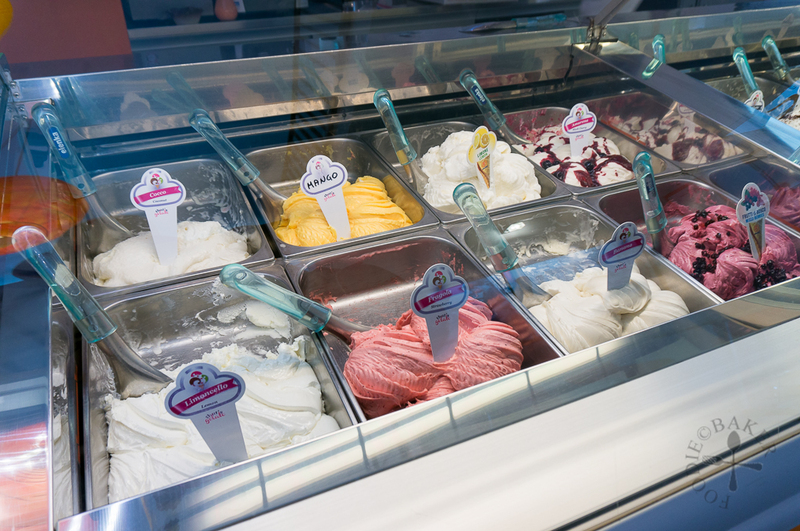 18 flavours to choose from – all look so good! 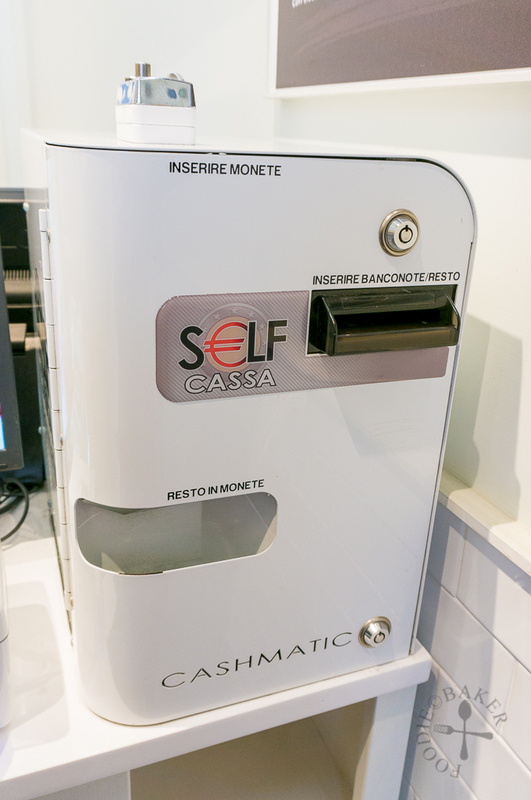 I was immediately drawn to the interesting concept of this gelateria – they have this machine called CashMatic which is connected to the cashier system. The server would first key in the amount for your ice cream, then you put in the notes and the machine will automatically compute and dispense the change. Having worked in an ice cream shop before, I really love this as it’s so much more hygienic – the servers will never have to touch the money! 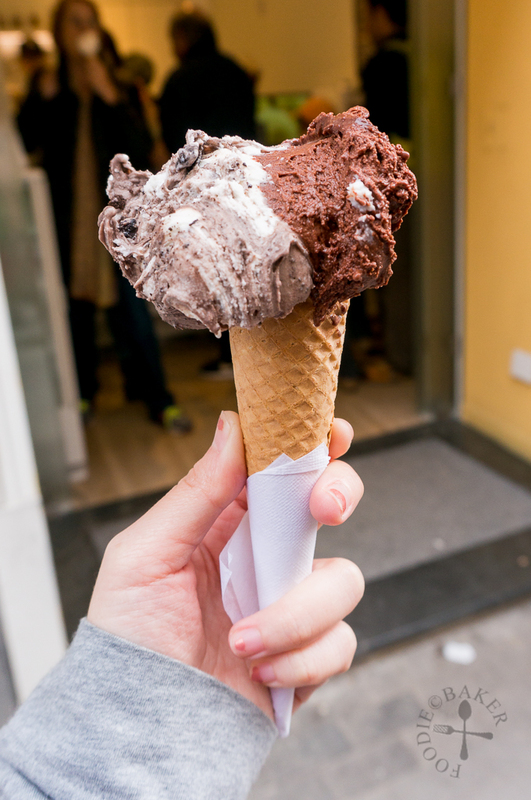 I chose a piccolo with 2 flavours – chocolate (yes, chocolate again!) and cookies and cream. The serving size feels similar to Gelateria Zini and it’s €1 cheaper, definitely a win! 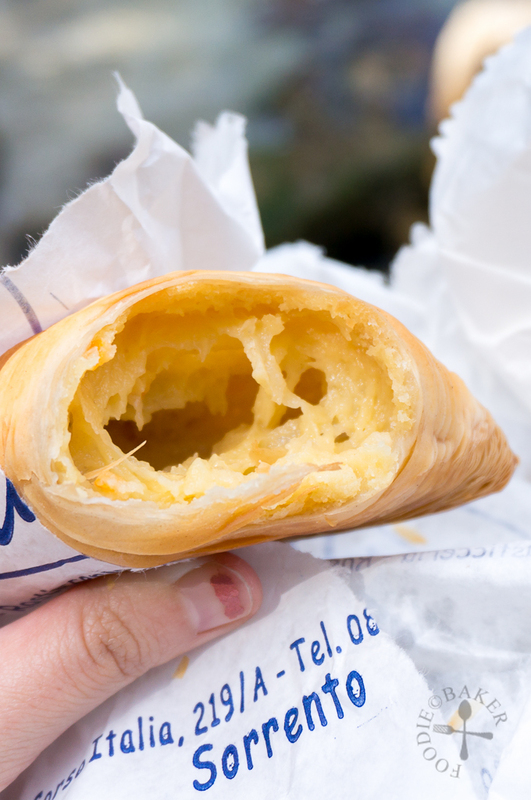 I chose flavours that can never go wrong, so they are definitely delicious! 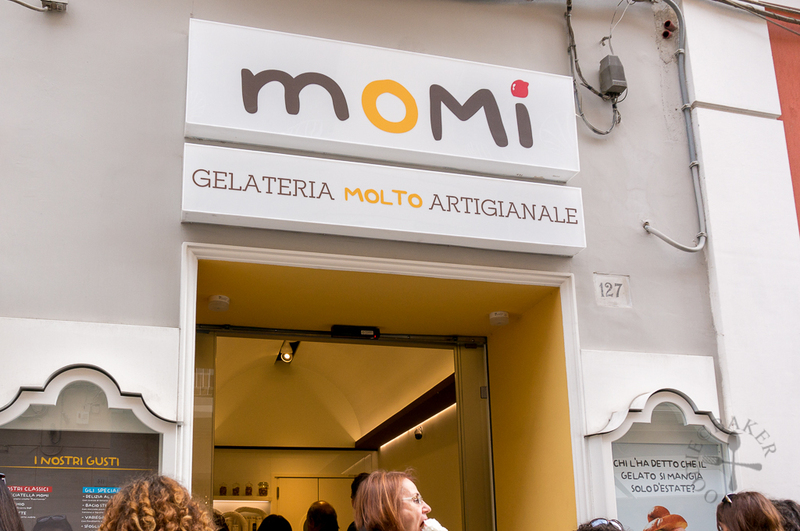 We saw another gelateria that was immensely crowded but as I was already having one, we decided to skip trying here. After 2 hours of rest (basically we just sat down at a bench and people-watch), it’s time for dinner! 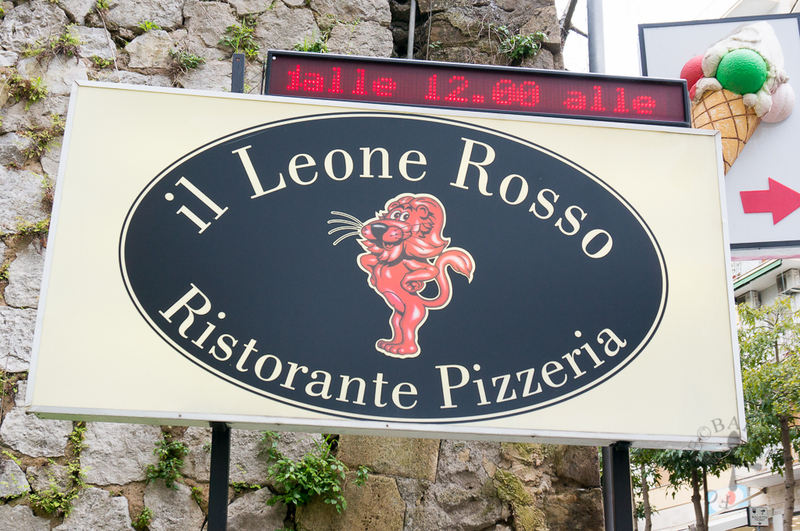 This time, we went to Il Leone Rosso, a restaurant and pizzeria located about 5-minute walk from Piazza Tasso. It looked really promising as even though it was only 6p.m, the restaurant was already pretty crowded. 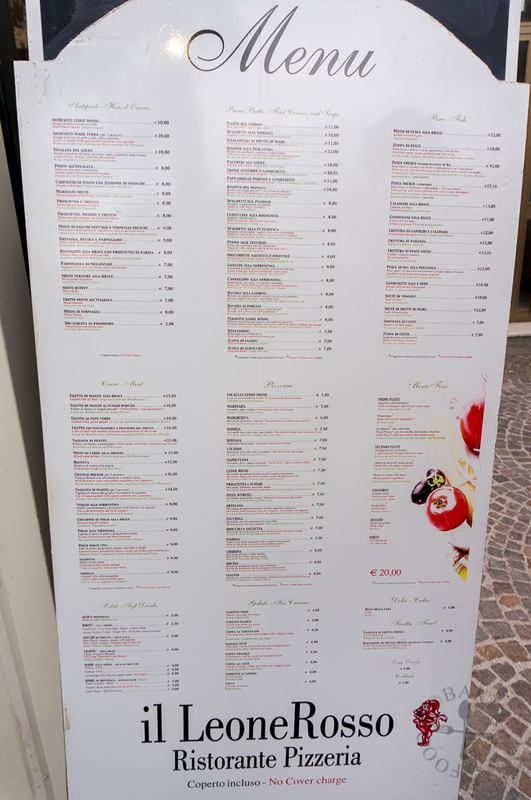 The restaurant had a menu outside, so we can decide for as long as we want before going in to order (but it’s not the most updated menu as the pizza we ordered later on was not in here). And the good thing is that there’s no cover charge, so what you see is what you pay (excluding tips). There were outdoor and indoor seats. As it was chilly, the outdoor seats were sheltered with a huge tentage and there was a heater to warm up the diners. I would have preferred sitting outside as the lighting there was much better for food photography, but we decided against it in the end as there were people smoking there too. 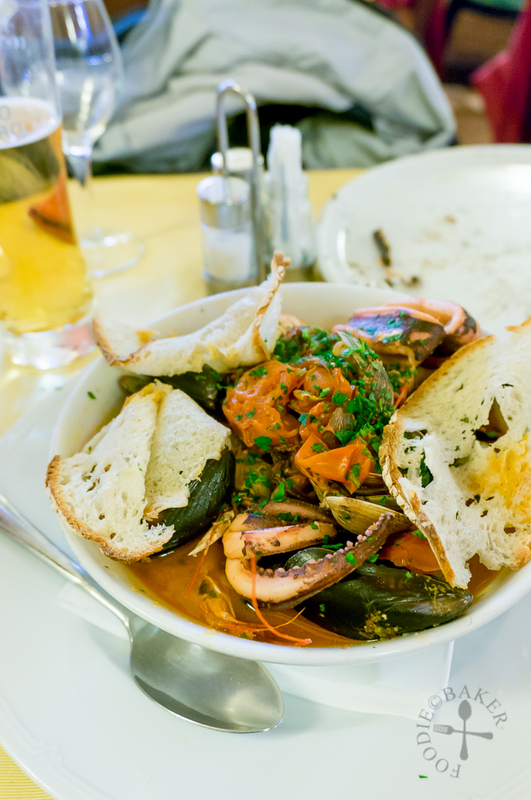 Learning from last night’s mistakes, we ordered seafood-based dishes this time round – a seafood pizza and zuppa di pesce, a seafood soup. 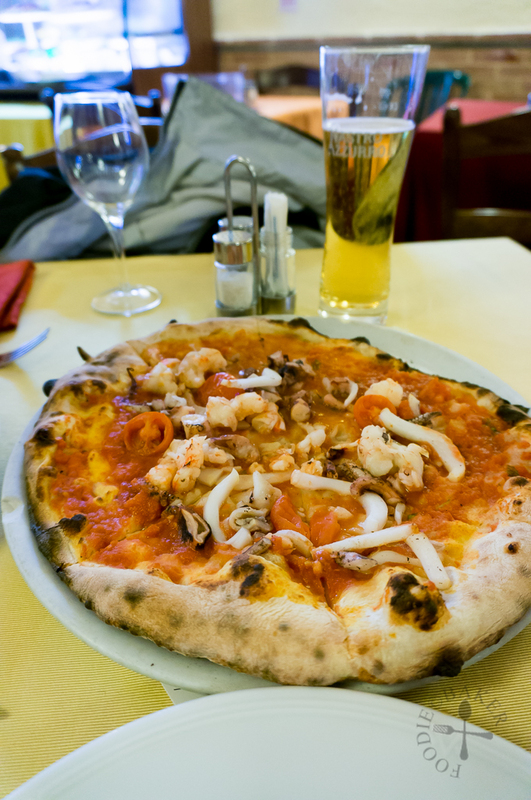 The pizza came first and we were delighted to see generous amount of fresh seafood atop a sweet tomato sauce. But my face lit up when the zuppa di pesce was served. 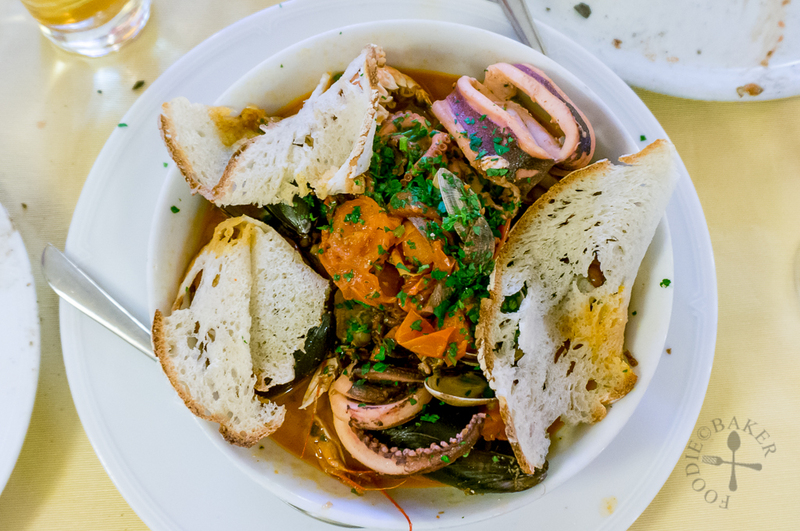 A tasty and umami broth filled with loads of seafood – there were mussels, squid, boneless fish fillet, prawns… Dipping the bread into the delicious broth is pure bliss! So delicious that it deserves another photo of it! 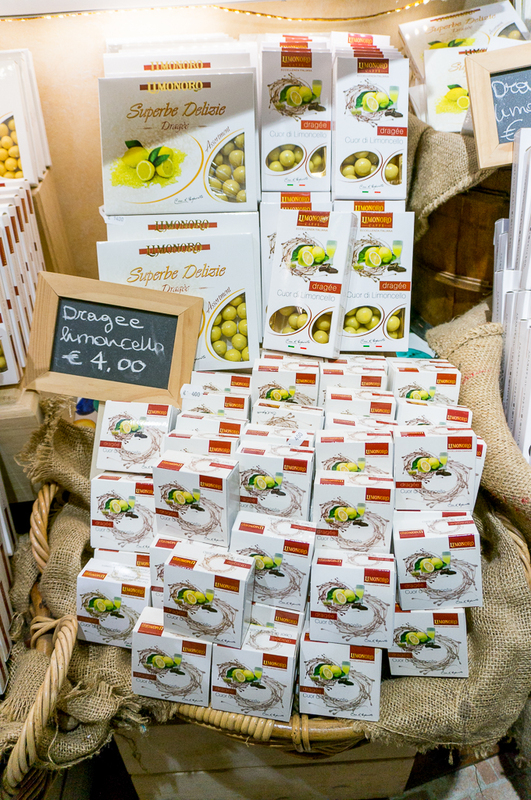 Limoncello is an Italian lemon liqueur produced mainly in Southern Italy, and Sorrento is extremely popular for it. 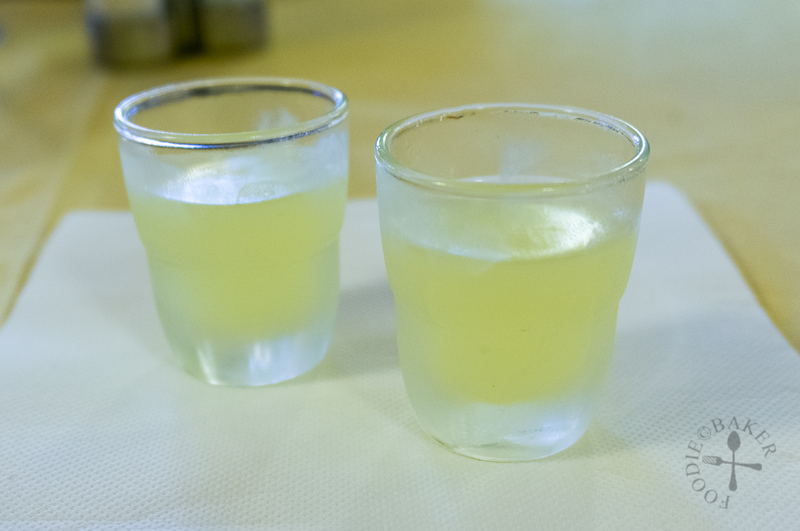 So after our meal, we asked the waiter if they have limoncello and he promptly served us 2 shot glasses of chilled limoncello, which were on the house. I’ve never tried limoncello before and I thought it’d be all lemony and sweet… but I was so wrong. Sorry, but limoncello is not my type of liquor! The best way to digest a full stomach of food is to do some shopping! 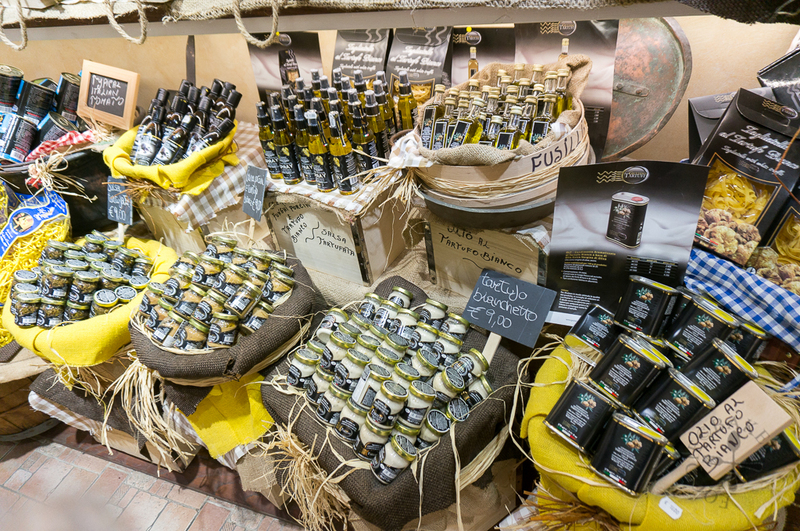 Italy’s the world’s largest producer of lemons, so it’s only natural they have created everything lemony. 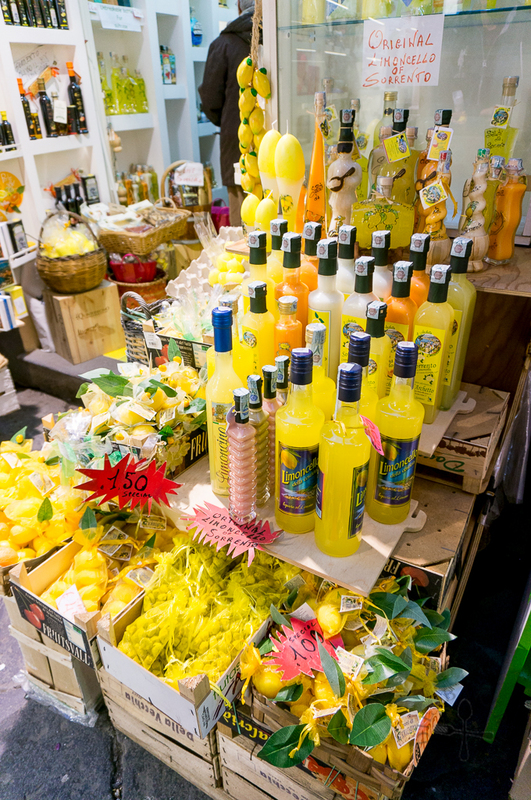 From limoncello to sweets to chocolate to chocolate with limoncello inside to lemon soap… there’s definitely something lemony for you! 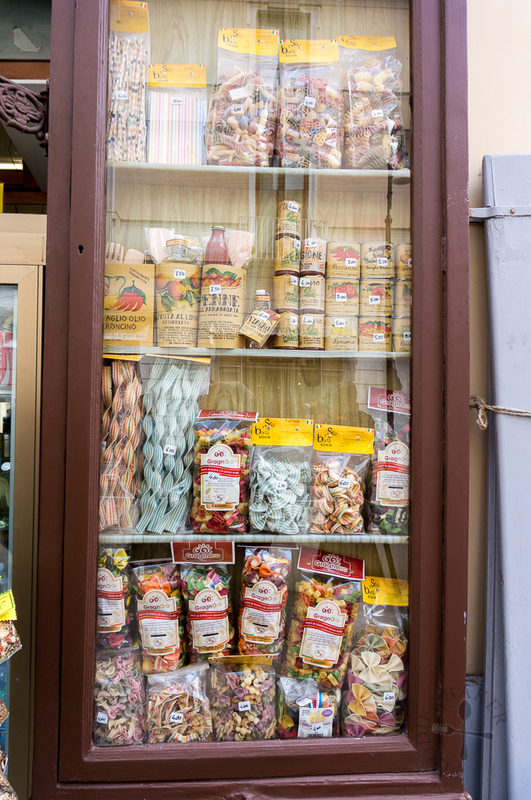 I also love looking at the different types of pastas they have on offer, but I didn’t manage to buy any back as I was afraid that I’d end up crushing them. They also had truffle, but we don’t really know how to appreciate it, so we didn’t buy any. 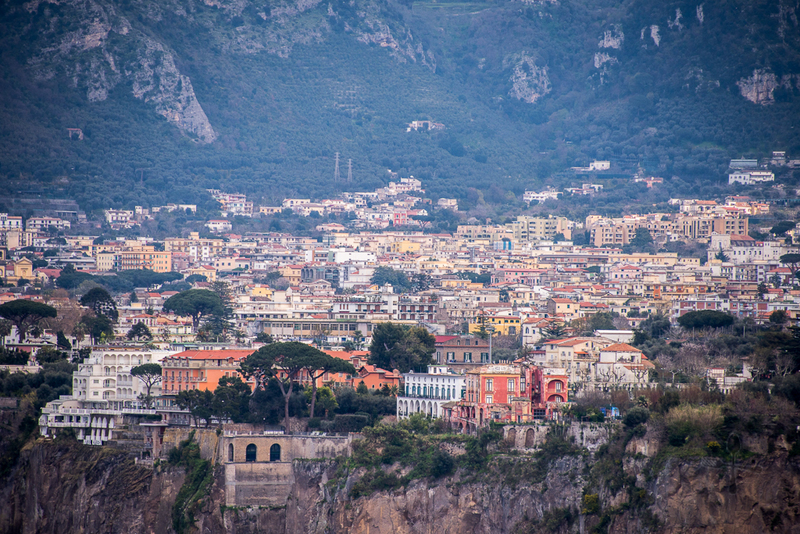 And that is all for Sorrento! 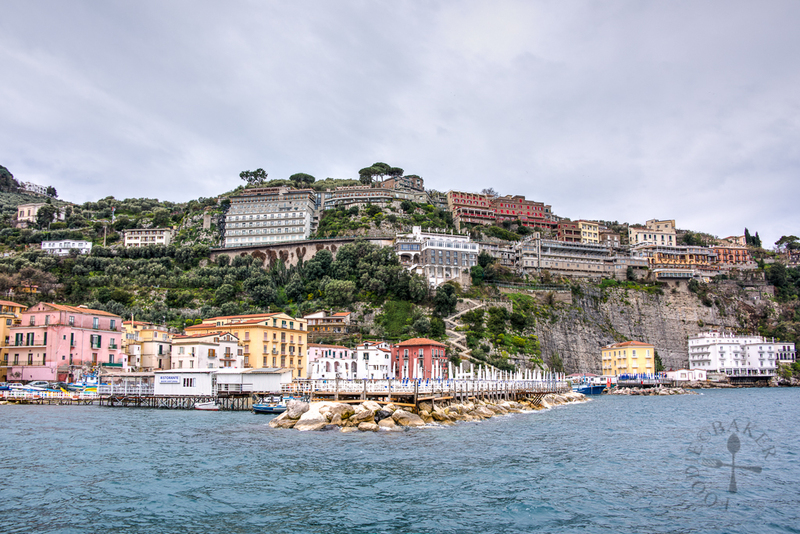 Out of all the coastal towns, my favourite has got to be Sorrento – the town is lively and bustling with people but you can easily get away from there to a beautiful and serene spot like the baths (unless it’s in the summer heh). Our BnB hosts were welcoming and hospitable who couldn’t have been friendlier (our BnB is called Lemon House BnB in case you are interested). 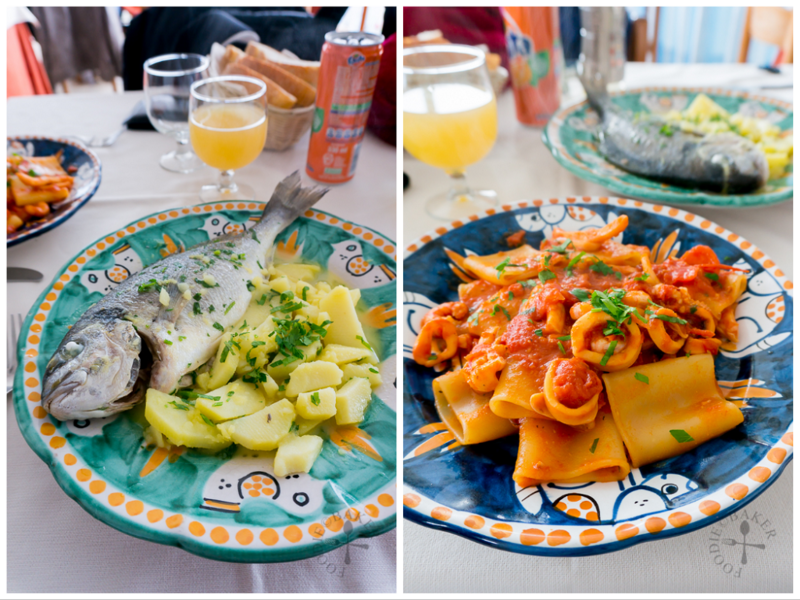 We had our best meal for the whole trip here, and maybe that’s why I’m so biased towards Sorrento. (; Till the next travelogue! And here’s a sneak preview of our next travelogue! 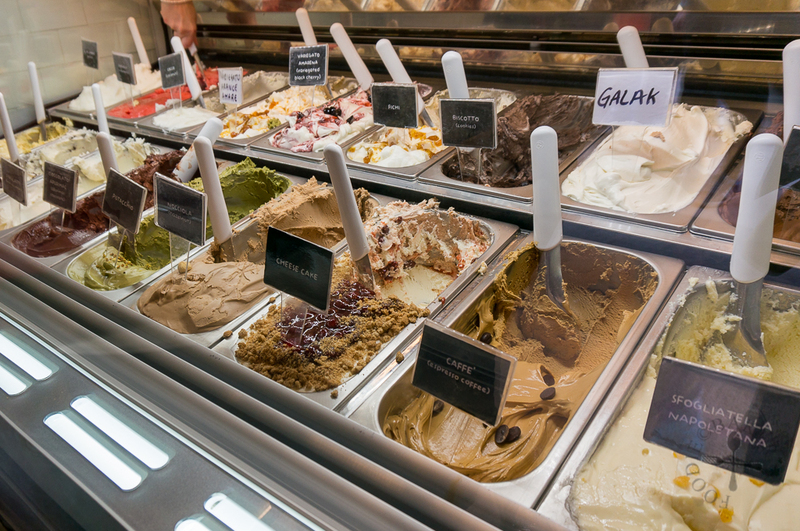 Ohhh those are the things I miss from Italy, the Gelaterias! What a wonderful trip with amazing pics. 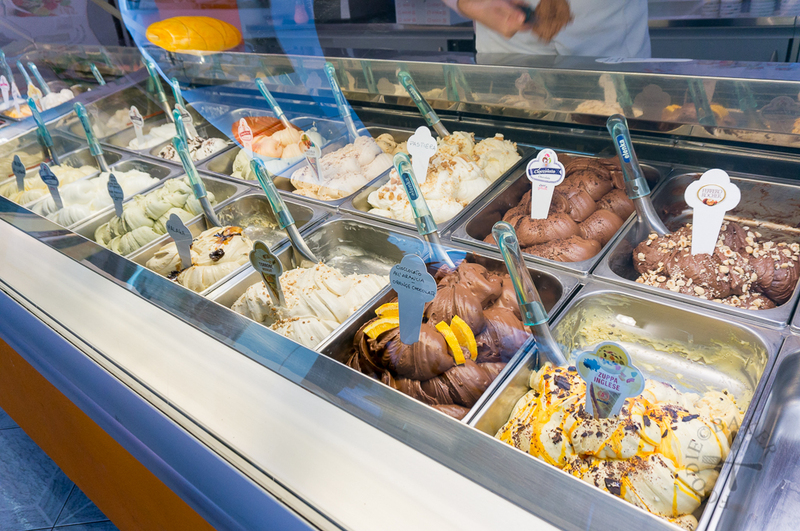 And these ice creams and pizzas- I’m hungry now. Thanks for sharing this trip with us.